Sony has announced that it will sell its production facilities for PS3 microprocessors and graphic chips to Toshiba. While the exact price has yet to be set, best guesstimates place the asking cost at $858 million, just a little more than the total EA just paid to acquire Bioware and Pandemic. In exchange for its millions, Toshiba will acquire the "Cell" microprocessor production facility in Nagasaki and the "RSX" graphic chip production line in Oita by March 2008. 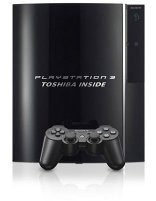 Sony also said it would continue to work with IBM to developer smaller, less expensive, cell chips as a part of their strategy to press on with the advancement of the key PS3 engine while cutting exposure to costly microchip assets. It does at that, doesn't it? An infusion of cash in the short term to keep the games unit afloat, perhaps. Just makes the Mistsui keiretsu bigger. Yeah, Sony has taken big risks here, played badly, but not all is lost. No matter how Sony pissed me off countless times, it would really turn out to be sad if the only survivors were Microsoft and Nintendo. The PS3 should start not sucking from sonys perspective in about 2 years when games are running better and the 360 is showing its age more but until then their lil games with the comsumer(no bwc on the 40GB and others) is only going to prolong "teh sux" ,they need to do what MS did offer the best they can and just absorb the losses, I am not the only one who thinks sony should quite dcking around offer ONE PS3 with BWC, 4 USB, HDMI, wifi, card reader and whatever HDD that floats their boat for 450 and be done with the price for acouple of year but no they want to keep to low sells and questionable business practices that make the consumer wonder what they are smoking.